It’s already been a busy year for the Pedalsport bike boxes and bags. As more riders take their own bikes to holiday or training camp breaks, the need to get the bike to your destination safely becomes a priority. We now have another new bike box/bag available for hire. The Biknd “Helium” case combines hard case technology at the ends, with inflatable side pods to provide perhaps the best protection available. It’s also very light compared to a traditional hard-case bike box and it can carry 2 pairs of wheels, opening up training and racing options on your break. There’s room also for shoes, helmet and tools! 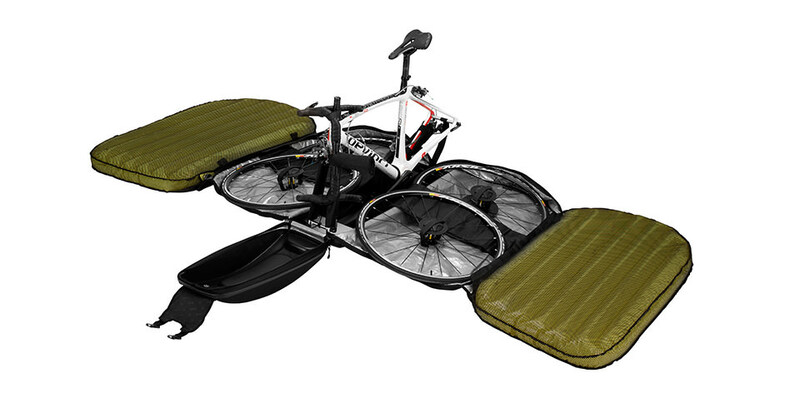 “THE HELIUM BIKE CASE uses a combination of light, flexible materials and strategically positioned rigid reinforcements, allowing it to offer excellent protection at a surprisingly low weight of only 11 kg (24 lbs). We charge £35 per week, plus a refundable £100 deposit. Call in at the shop or call us on 01422 361460 to book it now! This entry was posted in Latest News on March 25, 2014 by pedalsportclub.